It is April 26th 1478 and the setting is the Duomo of Santa Maria del Fiore where a mass is being celebrated. The Medici have been in charge of the government (virtually still a republic) since 1434 when Cosimo the Elder defeated the Albizzi, and was able to pass the reins of power to his son Piero, who in turn managed to secure the government in the capable hands of his sons Lorenzo and Giuliano. In the preceding decades the Medici had tried to keep up the appearance of a republican government but the political institutions had lost meaning. (They really had never been so democratic or popular and the most prominent families had always a control over the government seats.). The Medici exercised a strict control over the elections and created different ‘balie’, political entities with extraordinary powers, and slowly the oligarchy grew into a principality where nothing could be decided without the approval of Lorenzo. If Cosimo had managed , however , to maintain a consensus not purely based on intimidation and bullying, Lorenzo‘s control over every aspect of Florentine life gets really full and suffocating, beginning with the propaganda machine, with the display of the Medici symbols during all holidays and public events, and at the same time scaling back other families’ ambitions . It is understandable then that certain resentment grew among many families and in particular, we note among the Pazzi who had recently suffered a particularly stinging snub. By voting a law with retrospective effect on inheritance, Lorenzo precluded that the assets of the Pazzi could grow to an extent he deemed dangerous. But the political intrigue is much wider. Lorenzo’s enemies include the Pope whose interests collide with those of the Medici and the city of Florence, as well as the King of Naples, Ferrante I, from the city of Siena and the Duke of Urbino Federico da Montefeltro. It is in this environment that the conspiracy called “Pazzi ” takes shape, and erupts during the Easter Mass in the Cathedral at the signal of the ‘ite missa est’ . The conspiracy: places and leaders. If we are to follow the events of the day on a map we should start in via del Proconsolo, at the corner of Borgo Albizzi where the Pazzi family has its palazzo, an impressive house that could be one of the causes of hostility since the Medici do not appreciate competition even in these matters. A few hours before the murder we can imagine the nervousness of Francesco dei Pazzi and of his uncle Jacopo: it is the second time they have had to delay the attack because Giuliano was sick, but this time Francesco goes personally to pick up Giuliano at Palazzo Medici with his accomplice Bernardo Baroncelli. The Palazzo is just a short step from the Duomo but the two conspirators embrace Giuliano, showing their affection (but mainly to check he is not wearing a cuirass). 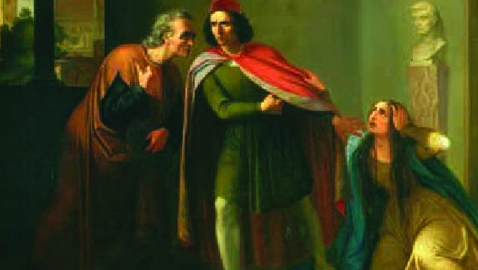 While Francesco and Bernardo take care of Giuliano a professional “hitman” Giovanni Battista da Montesecco has been hired to kill Lorenzo. He backs out at the last moment, perhaps for fear of sacrilege, so the murder is assigned to two priests apparently less scrupulous, Stefano da Bagnone and Antonio Maffei. Jacopo de ‘ Pazzi as we shall see is assigned another task which is to incite the crowd immediately after the crime, while outside the city mercenary troops are ready to intervene. 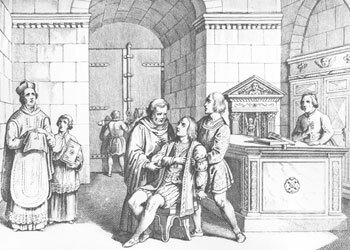 Upon the signal Giuliano is attacked near the door of the cathedral and killed by multiple stab wounds by Francesco and Bernardo with such violence that Francis in the excitement ends up seriously hurting himself in the leg. Lorenzo is walking a hundred feet away near the altar, under the famous dome of Brunelleschi, and he cannot see what is happening. He is approached by the two priests but they only wound him slightly in the neck.Helped and protected by his companions (one of whom , Francesco Nori, is mortally wounded), he escapes and finds shelter in the New Sacristy (on the north side of the Cathedral) , closing the heavy bronze doors – with the twelve panels ​​by Luca della Robbia and topped by a bezel by the same artist – depicting the Resurrection . The group, including the famous humanist Poliziano, remains several minutes, maybe an hour, inside the Sacristy – probably paying little attention to the carvings made ​​by Giuliano and Benedetto da Majano, designs by Brunelleschi and Antonio del Pollaiuolo – in silence in an attempt to pick up something of what is happening outside. At one point someone starts knocking, but it is unclear whether it is friend or foe. The situation is clarified by a friend of Lorenzo who, climbing the narrow spiral staircase leading to the organ gallery, can see the inside of the church, now empty except for the corpse of Julian. Those who are knocking are trustworthy people, and the group finally decides to run for shelter in the neighboring family palace. Meanwhile, another member of the conspiracy, the Archbishop of Pisa Francesco Salviati with thirty men go quietly into the Palazzo Vecchio (the seat of the government), in an attempt to occupy it from the inside. Clumsily done, the showdown ends with the Archbishop taken prisoner by Gonfaloniere himself and his men isolated in the registry of the palace, while the guards now rush to help and ring the bells. Another handful of armed men on horseback, led by Jacopo de ‘ Pazzi, rushes noisily towards Palazzo Vecchio, trying to rouse the citizens by shouting “People and freedom.” The legend – of Medicean origin – says that people answered shouting “Balls! Balls! 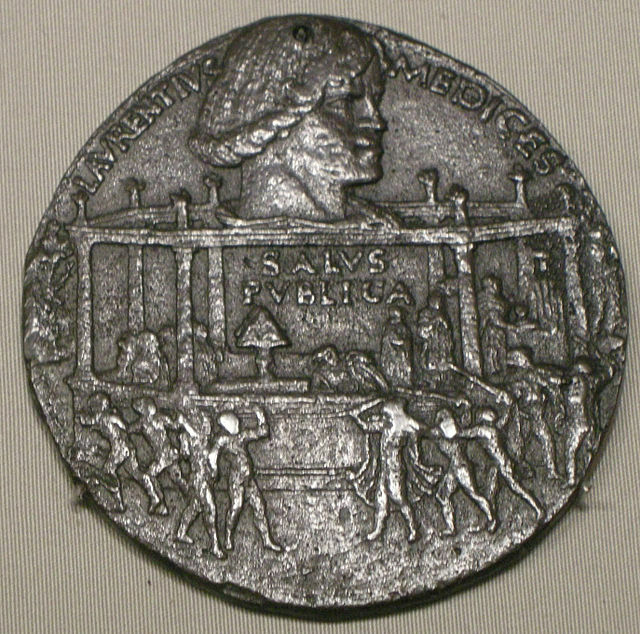 ” ( the balls of the Medici crest), but it is reasonable to think that the majority of citizens were waiting to be able to side with the winner, since there are no reports of major armed clashes in the streets of city ​​.Once the men of Jacopo arrive at Palazzo Vecchio they try to enter and liberate the other conspirators, but the palace guards fight them off. It is likely at this stage that the fortunes of the conspiracy, so far uncertain are decided. Over time, in fact, and with the troops camped out of town not showing up (perhaps frightened by the sound of the bells), Jacopo de ‘ Pazzi begins to see the situation as increasingly desperate, and he decides to flee. By this time the whole town is against him. On that same day in the afternoon the body of Francesco de’ Pazzi is hung at the windows of the Palazzo Vecchio. Next to him are Archbishop Francesco (a particularly degrading execution for a clergyman) and his brother Jacopo Salviati and other conspirators. According to the testimony of Poliziano the archbishop, in a fit of hatred, finds time to bite the chest Francesco before dying. In the days following dozens of victims, maybe a hundred, are killed in fierce and relentless revenge and their bodies are exhibited in contempt to the people. The fate of the old Jacopo de ‘ Pazzi is particularly gruesome. He is captured in San Godenzo, and savagely beaten.He arrives in Florence already unable to walk, and after being questioned he is hanged at the same window as Francesco. In sign of mercy, perhaps through the intercession of the Bianca Medici, an acquired relative, he is buried, with the rope still around his neck, in his family chapel, the famous Pazzi Chapel designed by Brunelleschi, in the Basilica of Santa Croce. About a month later a gang of boys extracts the body from the grave and drags him by the noose through the streets to the door of his palace. Here they try to use the body as a battering ram to break down the door. 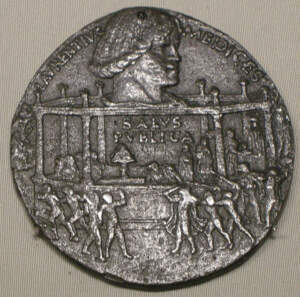 Then they drag him to the bridge Rubaconte (today Ponte alle Grazie) and they throw his remains in the Arno. A couple of days later he is again pulled out of the water, near Brozzi , hanged from a willow tree and beaten again , then thrown back into the Arno to finish offshore. The danger for Lorenzo is actually not yet passed. The external enemies, with the pope at the front, want his head, but in the end the Medici regime emerges strengthened, although always supported on the fragile foundations of the violent repression of all opposition and on personal charisma of Lorenzo, as becomes evident after his death, in 1492. This post was inspired by April Blood by Lauro Martines and A History of Florence. 1200-1575 by John Najemy.